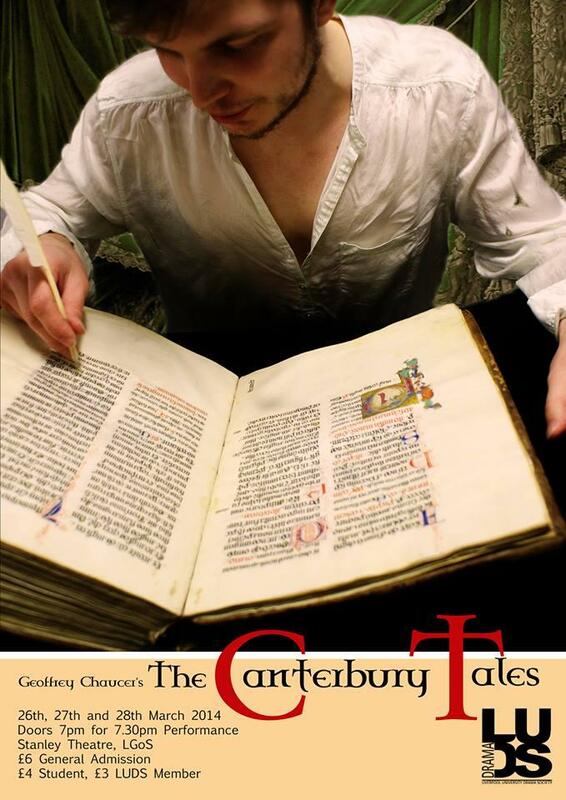 An abridged version of Mike Poulton’s Chaucer’s The Canterbury Tales. Performed at The Stanley Theatre, University of Liverpool, by Liverpool University Drama Society and The Liverpool Players. The Pilgrims – Daniel Murphy, Shamus Cooke, Alex Webber-Date, Liam Hale, Trixie Roddick, George Parsons, Angela Hehir, Faisal Yousif. The Players – Charles Adey, James Rooney, Lewis Smith, Imogen Wignall, Katie Overbury, Jacob Lowman, Madelaine Smart, Johnny Campbell, Charlotte Wilson, George Trier. Minstrels – Darren Begley (bodhrán), Alex Cottrell (psaltery), Sarah Peverley (harp) Meave Sullivan (flute). Programme, Poster, Images, Music Feature.